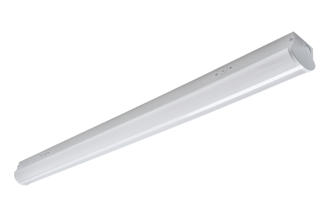 The Aleo LLS Series LED Linear Strip Luminaire delivers industry-leading performance with deep energy savings and continuous dimming. Low profile design offers easy handling and storage. This versatile luminaire produces energy-efficient, comfortable illumination for a myriad of applications. Excellent for general utilty applications: Parking garage, warehouse, offices, restrooms, storage units, stairwell. Integral LED gear tray and reflector with driver on board allows for easy installation and handling. Luminaire features matte white durable finish. Diffuser requires no additional frame or fastener for easy installation. Luminaire back housing includes holes and slots for various mounting methods. Continuous dimming (0-10V) comes standard. Suitable for use with dimmers, sensors, daylight harvesting and other control strategies to achieve deeper energysavings and code compliance. Sensor accessory available: occupancy sensing with daylight cut-off.